A novelty at Tucson 2019. 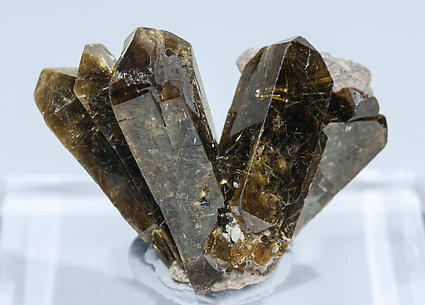 Group of very well defined crystals, some of them completely or partially doubly terminated, formed by a prism and a terminal bipyramid, translucent, extraordinarily bright with a dark brown color with golden reflections due to abundant Rutile inclusions. An excellent miniature. A sharp crystal of very sharp faces and edges and good color and luster. On Quartz matrix. 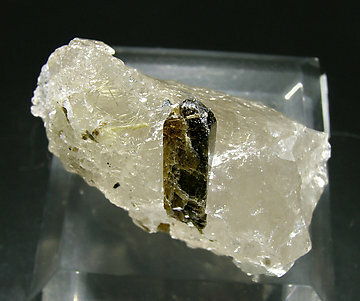 Prismatic crystal, small but perfectly defined, that has an uncommon degree of transparency. Color and luster are excellent. 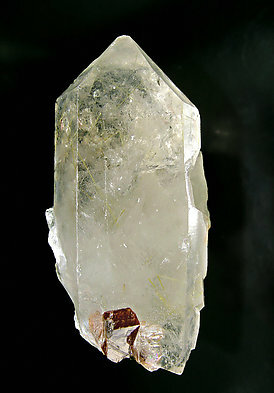 The crystal is on a partially doubly terminated crystal of Quartz with included needles of Rutile.